16 Days of Activism Against Gender-Based Violence Campaign has announced its new theme for 2015. In Lebanon Education is a huge domain in which clear action plans need to be implemented, the Problem is access and quality of education for several people living in Lebanon. I am thinking of all those IDPs camp in which I was greeted by yound children that didn’t go to school, and stayed in the camps all day long. CWGL is in the process of developing resources and campaign materials, which will provide useful background information on the theme and suggestions for planning campaign activities. CWGL will be posting these resources on the 16 Days Campaign website over the months leading up to the campaign. You can also write to the 16 Days Campaign (16days@cwgl.rutgers.edu) to request hard copies of these materials. Participants can visit our website (http://16days.cwgl.rutgers.edu) to download the Take Action Kit materials or to request a hard copy when available. Join the 16 Days Campaign! The 16 Days Campaign is open to participants engaging in action on these issues in ways that are relevant to their specific context. Participants know best on what and with whom they can engage – whether their governments or communities – to challenge and change in positive terms the structures which perpetuate gender-based violence. Create or join a community, campus, national or international activity! Request campaign materials, join the 16 Days listserv, and use past International Calendars of Activities (available online) to spark ideas for your activities or to find information about groups in your area. Use of the hashtag #16Days on social media is encouraged! As November approaches, remember to submit your plans to CWGL for posting to the 2015 International Campaign Calendar to become part of the global 16 Days Campaign movement. The International Campaign Calendar can be found at http://16dayscwgl.rutgers.edu/campaign-calendar. If you would like more information about the international 16 Days Campaign, please visit the website http://www.cwgl.rutgers.edu/16days/home.html. Pictures from previous 16 Days Campaigns can be viewed on Flickr at https://www.flickr.com/photos/16dayscampaign. Sign up for the 16 Days e-mail list! Join the 16 Days of Activism Against Gender-Based Violence e-mail listserv, which gives activists a space to share work against violence, build partnerships with others worldwide, and develop strategies and themes for the annual 16 Days Campaign. Sign up at https://email.rutgers.edu/mailman/listinfo/16days_discussion. Since its founding in 1991, the Center for Women’s Global Leadership has been the global coordinator of the 16 Days of Activism Against Gender-Based Violence Campaign. For the past twenty-five years, the 16 Days Campaign has been dedicated to advocacy and coordination of work in support of ending gender-based violence at the local, national, and international levels. The dates, November 25th (International Day for the Elimination of Violence Against Women) and December 10th (Human Rights Day), were chosen to emphasize the links between ending gender-based violence and human rights principles and highlight that gender-based violence is an international human rights violation. 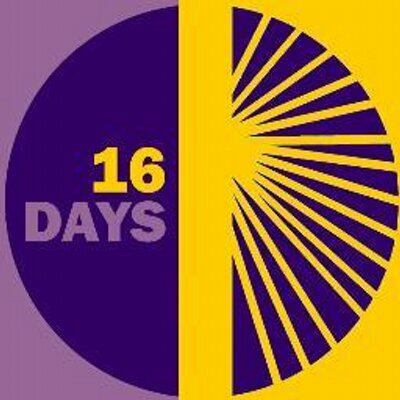 The 16 Days Campaign is used as an organizing strategy to call for the elimination of all forms of gender-based violence by individuals, groups, and institutions throughout the world.